Tower of David Museum Director Eilat Lieber describes the production as a "gift" to King David. 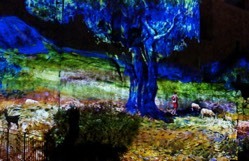 Four nights a week, the ancient walls of the Tower of David Museum become a canvas for telling the story of the shepherd boy who would grow up to lead Israel. Renee Sivan is the concept creation and curator of the museum's newest venture. She describes it as getting to know King David through paintings and sculpture of the old masters. "But we don't have objects, materials. There are no pictures of King David, so I decided to make it through art, pieces of art and they are the masterpieces, the big masters like Chagall, like Rembrandt, like Matisse, everyone, Michelangelo," Sivan explained to CBN News. "So it was the perfect thing ... let's travel through art to meet the king." And in that journey, the audience learns how David became a universal figure. "David in the Muslim religion is a prophet. For the Christians, he's in the roots of Christ. And for the Jews ... he reunified all the tribes in one site, in Jerusalem, the capital of the Jewish people," Sivan said. "To see the story of King David was a dream because, as you know, the citadel [David's Citadel] is called after his name. And he is the king who established the city and he is the king of the Bible and we feel it's a gift actually for him," Lieber said. "King David left his legacy, which is the music and the songs of the Psalms," she continued. "While you are reading the Bible, you remember some stories, some you forget. So it [the light show] is not the full story, of course, but it's a taste of the experience of what is Jerusalem for us, what is Jerusalem for King David." Behind the scenes, the production requires a huge technical effort. It takes 35,000,000 pixels, 18 laser projectors, 20 speakers and more than six miles of cables. System Designer Eli Geffen says the software does the work. He explained, "Each computer is connected to a projector. What is powerful is the software behind the system that synchronizes maps, controls and does almost everything behind the scenes for the show." Yet the technology and the show itself are designed to bring people from all over the world to Jerusalem where they can connect. "We want to open this place to people from all over the world," Lieber said. "We feel that this place can connect people from all over the world who love Jerusalem, who want to know more about Jerusalem."